We visited friends who are house sitting in the Tarn region of France. 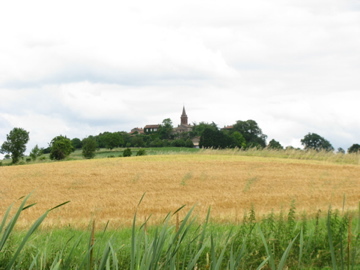 This area is known as the Pays de Cocagne (the land of plenty) and you can see why. It is a rich agriculture region with vineyards and fields of wheat, corn, sunflowers and potatoes, an abundance of farmers markets and all sorts of wonderful local produce. The food that the region seems to celebrate the most is duck, and when I say duck, I mean ALL things duck. Nothing is wasted, indeed we were told that people used to eat the lungs. 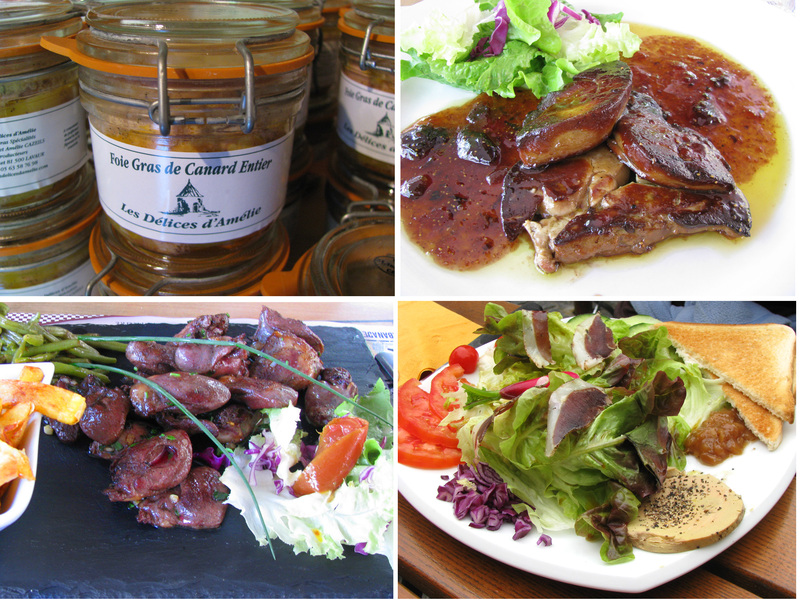 Clockwise from top left: Foie gras entier (whole), fois gras cuit (cooked), duck breast magret (dried duck meat) and duck hearts. 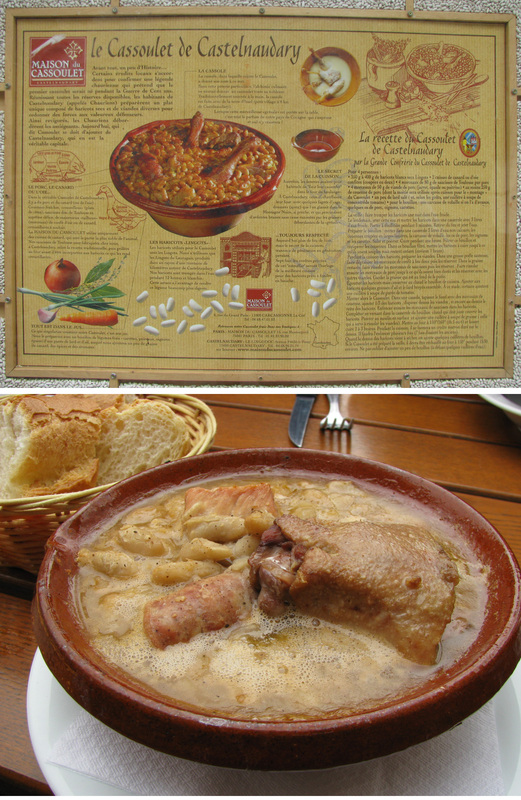 One duck specialty of the region is cassoulet and it was a staple on every menu we saw. We visited Carcassonne, a walled city which is the largest fortress in Europe and enjoyed an al fresco meal of this dish with a glass of local wine. Cassoulet is rich dish of duck confit with white beans, meat and sausage and best mopped up with copious quantities of baguette. Having eaten foie gras at Roka the previous week and being aware of some of the ethical issues surrounding foie gras we were keen to see for ourselves what was involved in the production of foie gras. 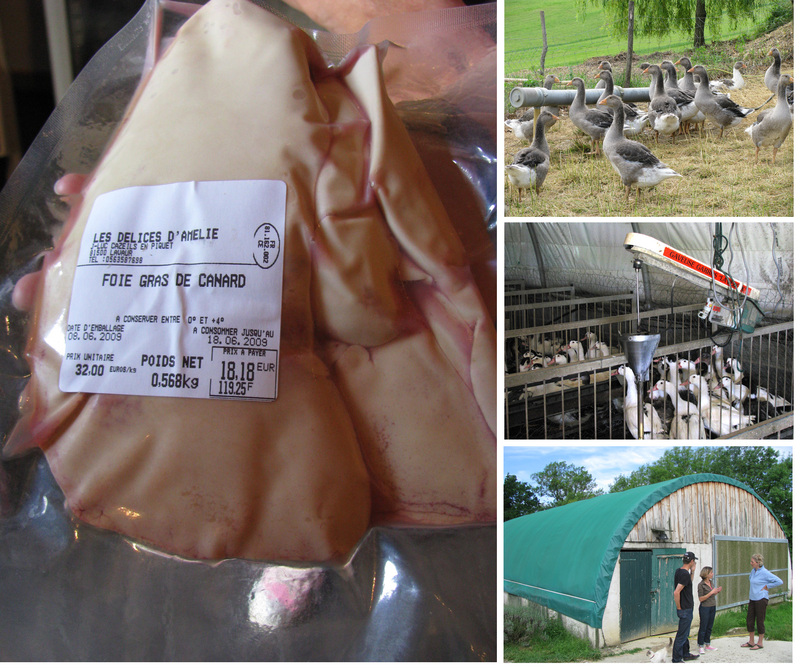 We visited a farm that produces both duck and goose foie gras, Delices d’Amelie and were given a tour by Amelie herself. Delices d’Amelie produce foie gras in the traditional method (as opposed to the more intensive industrial method where birds are kept in small individual cages) and they have been farming here for 7 years. Foie gras is made using a process called gavage where for the last 2-3 weeks of their lives the birds are force fed grain soaked in water to fatten their liver, exploiting a natural adaptation where in the wild they would fatten themselves up for migration. The force feeding occurs 2-3 times a day and the birds therefore spend only a few minutes a day with a tube down their throat. Most of their lives they are outside. The geese are Grise des Landes and the ducks are Moulard. Foie gras is only made from male ducks but can be made from male and female geese. Goose foie gras is said to have a more subtle flavor. The birds are killed within 12 hours of their last feed for maximum liver size. The optimal size for a liver for foie gras is 350-550g. If it is smaller it is not foie gras and if it is over 550g it is too fatty and melts when cooked. In addition to foie gras in all its forms (entier, bloc, mi cuit etc) Amelie had a lot of other duck products included rilettes, ballotine, pates, confit, duck crackling (I forget the french term) and fresh duck meat including aiguelettes, the thin muscle near the neck which is another prized delicacy. I have some mixed emotions about foie gras. Whether or not it should be eaten is a complicated but I definitely feel better informed. I just borrowed a book from the library called ‘The Foie Gras Wars: How a 5,000-year-old delicacy inspired the world’s fiercest food fight” by Mark Caro and I hope to learn more from that. I did not think it was as inhumane as many people believe, certainly it was not in the instance that we saw, but I am sure the methods of production vary. I don’t think it is any more cruel than most industrial meat production. Like any food, everyone has to make their own decision about what they are comfortable eating. 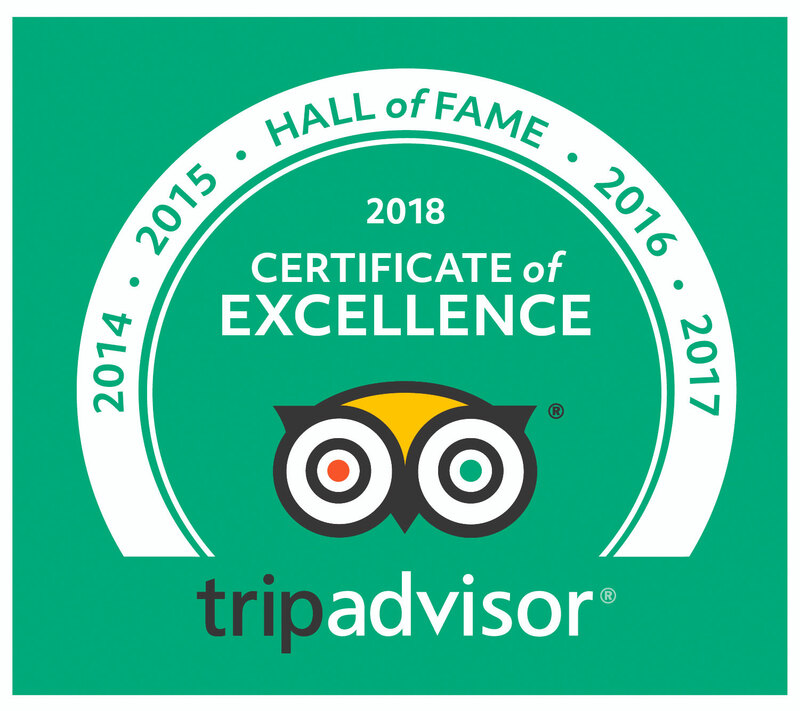 thank you very much for your article about your visit of our farm. The photos are very beautiful. Can I use some of them for our publicity?